Home » italian » recipe » RECIPE: Italian breaded chicken and the origins of "the parmo"
RECIPE: Italian breaded chicken and the origins of "the parmo"
I really couldn't believe my eyes when I read about the "parmo", a Teeside post-booze takeaway delicacy of fried breaded chicken, topped with bechamel sauce and covered in melted cheese. The name Parmo derives from Pollo alla Parmigiana, but I guess it is easier to call for a parmo after a skinful. Parmigiano means "from Parma", a northern Italian town in the food mamma-ship region that is Emilia Romagna. So no, it is not meant to contain Parmesan cheese. Thinly cut, breaded and fried veal, pork or chicken is a very common dish in Italy but I have never eaten or seen it topped with anything, least of all bechamel sauce! As Italian food varies between regions, I thought I just may not have come across it before. Typically you tend to only eat the cuisine from your region and because every Italian thinks (and argues!) that their own is best, whole areas of Italian cuisine can be easily missed. After a bit of research I couldn't find the origins of the authentic Italian "parmo". The closest I got was a popular tomato sauce and mozzarella topped breaded chicken dish called Chicken Parmigiana that has evolved outside of Italy. It seems to be most popular in America and Australia, two countries that have huge settlements of Italian immigrants. 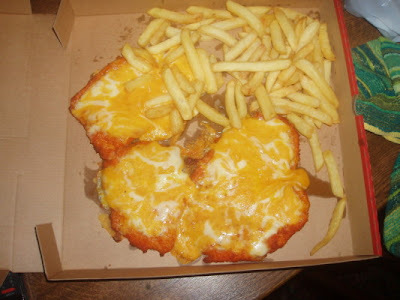 Still scratching my head about the Teeside parmo love though! As loved as it is, I'm not convinced on this dish but what the hell do I know, because Asda is apparently selling 6,000 chicken parmos a week in their store in Teeside, the shop's fastest selling item. Due to their growing success Asda are thinking of rolling out the line nationally. 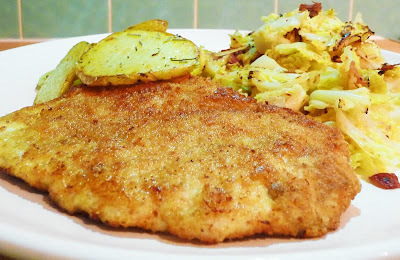 Until that time, here is my recipe for breaded chicken, of course veal and pork can be used as well. I don't know why but cooking this method produces the most moorish, succulent meat. Perfect on its own with just some slices of lemon, sauteed potaoes and a salad. But if you wish to top this recipe with bechamel or tomato sauce, pepperoni, garlic butter, cheddar cheese, pineapple or whatever, then knock yourselves out. 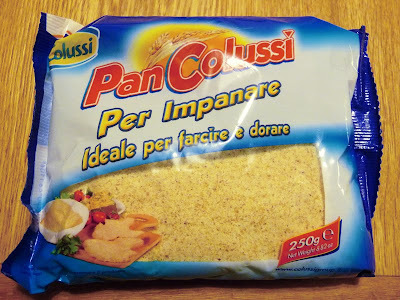 The breadcrumbs I use are packeted Italian breadcrumbs that give a much better result than homemade. I bring back suitcase loads of these (god help me if customs stop me) but you must be able to get them in good Italian delis or online. For example, the Mulino Bianco range is good and available here. Homemade breadcrumbs can be used but just make sure they are very dry and extremely fine. Take either a chicken breast or veal or pork escalope and using a meat mallet, bash it until very, very thin. The thinner, the better but you still need to pick the piece up without it breaking! Beat an egg in a bowl and season. On a large flat plate spread out your breadcrumbs. Coat the meat in the egg mixture then dip into the breadcrumbs, pressing down firmly. In a large frying pan, pour in enough olive oil to cover the base of pan and heat. Fry the bread crumbed meat, tuning once, until golden. Pop onto the plate with the kitchen roll and place in an oven on a low temperature to keep warm if you are doing a big batch.